Great Ways to Experience Connecticut! What’s the best way to really experience Connecticut? Zip lining through treetops? Finding your moment of zen at a luxurious spa? Or would you rather take a trip back into history, or savor New England’s best seafood at a real roadside clam shack? 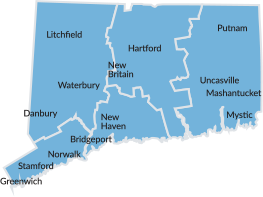 With so many attractions and activities in one small state, Connecticut offers a complete experience in a compact package. Whether you’re here looking for things to do, or just to discover something new, we’ve got experiences perfectly designed for everyone from families to foodies. If you like adventures and the great outdoors, you’ll find a lot of things to do in Connecticut, from hiking trails to saltwater sails. Always ahead of the cultural curve, Connecticut is home to amazing art galleries, award-winning theaters, unique museums and modern architectural marvels. Got kids? Let Connecticut introduce them to classic amusement parks, aquariums filled with friendly creatures and of course the joys of “pick-your-own” farms. Explore our Revolutionary War sites, Victorian architecture, town greens, military accomplishments and other historic attractions in Connecticut. Unwind with a night at a seaside inn or a weekend in a cozy B&B. Then recharge with a stroll in a vineyard or roll the dice in one of our world-class casinos.